Care 4 Freedom are a dedicated team of people with a wealth of experience in health and social care. We provide and ensure a safe and friendly service within your own home and the community, valuing your independence, quality of life and choices. All our staff team are DSB(CRB) checked and are trained to an excellent standard to ensure that you receive the highest possible quality of care and support. We provide support to all in the community. Care 4 Freedom was founded on personal and professional experience. The Care for Freedom team is staffed by people who share a common goal – a passion to provide the best support and care to improve quality of life, client choice being at the fore front of the service provided. 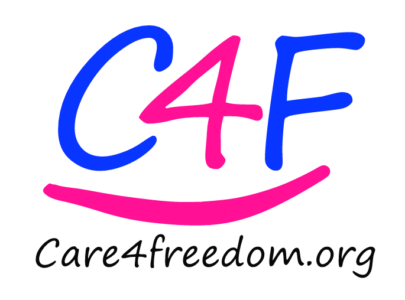 Care 4 Freedom are CQC registered, enabling us to provide personal care for those who require it, we also hold a day opportunities contract with Herfordshire County Council and we are approved providers for Hertfordshire Partnership NHS trust (HPFT). Care 4 Freedom believe that communication is one of the keys to a fantastic social care experience, and we are proud that this is achieved on a daily basis with the people we work with and their families. Our service has been discribed by the people we support as ” The Care 4 Freedom team are part of my family.” and ” Care 4 Freedom are professional family and carers, they keep me and my family in the loop, this helps me stay well”. 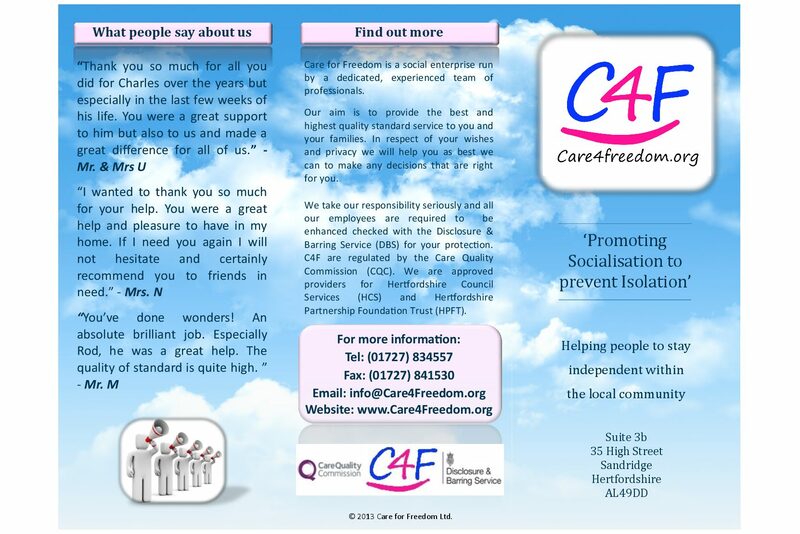 Care 4 Freedom liase with other professionals and organisations to ensure that all of your social needs are met ,helping you stay independant utlising your local amenites. This may help to prevent hospital admissions or ensure a shorter admission time. Attending appointments: GP, Department of work of Pensions (DWP), Hospital. Care 4 Freedom offer a Brokerage service, assisting you to design your own care plan, helping you to identify your support needs, via your own personal budget or direct payment. This service offers realistic and genuine opportunities and promotes your independance and social skills, helping you to find the support you need within your own area. Care 4 Living offers enviromental support within your own home, if your home requires de-cluttering, decorating or deep cleaning, this is the service for you. Care 4 Living also offers a hospital to home service where we ensure your home is ready to go home to, we are also able to help collect personal items from home to be brought you in hospital. We are able to support your personal care needs as well as your social needs at home and in the community, providing 1:1 support either on a short term or longer term basis. The choice is yours !! Keywords: personal care, social, holidays, short breaks, companionship, meal preparation, cleaning, de-cluttering, hoarding, attending appointments, benefits, respite for carers, medication support, outings, Brokerage, housing issues, tenancy support, education, handyman, garden, care plan and support, community, recovery, direct payments, personal budget, inclusion, practical support, building skills, independance, mental health, older people, learning disablities, physical disablities, wellbeing, health, social care, assesment, travel training, confidence, self esteem, complex, safeguarding, prevention, hospital, enablement, fulfilling, equality, home care, supported living, voluntary, dementia, adult day opportunities, early intervention, community, drug and alcohol, St Albans, Dacorum, Watford, Welwyn Garden City, Hertfordshire, families, dedication, communication, back to work, holistic, whole.